Highlights that stand out over the seasons of 2015 were sensory experiences I will not forget. Thank you to Claude Thibaut, winemaker and friend, who graciously helped us showcase the elegance and entertaining value of our clients home for sale in Northern Albemarle county. It was a sparkling day in January with crystal blue skies, ridges of mountains in the background and fireplaces warming us as Claude poured flutes of Thibaut-Janisson Extra Brut. The home was a house of celebrations and what better way to exemplify it then offering Thibaut-Janisson bubbly for our agents and guests to enjoy during the tour. And yes, the home sold and there is a new owner; I hope they are toasting in the New Year with TJ Extra Brut! The second highlight was a quite grand event- the official ribbon cutting at the Albemarle Estate, 98 pastoral acres and the 23,000 square foot, 45 room mansion. Strategically purchased by Donald Trump at a fantastically low $6,700,000 price after having already secured the Kluge Estate Winery and portions of the vineyards surrounding the property. Thanks to good friend Mark Norman, President of World Wine Marketing and Kerry Woolard, General Manager of all operations at Trump Estate, I was invited and able to see the opulent interior and manicured Italianate gardens of Albemarle House! In Trump style (pardon the cliché) guests as well as local dignitaries gathered in front of the manor, newscasters in place poised with microphones as the chop-chop-chop sounds of the highly recognizable private helicopter landed yards away from our seats. Introductions followed including Eric Trump, Donald’s son who has taken leadership of Trump Estate Winery as President and Kerry Woolard, General Manager. Both have impressive credentials and since taking over the foreclosed property have placed the Trump name significantly on the map in Virginia wine country. The third and final highlight for me was a return trip on December 10th to the fully operational Albemarle Estate for a Virginia Wine Chat event hosted and moderated by well known popular wine expert and blogger, Frank Morgan of Drink What You Like and Jonathan Wheeler, Winemaker for Trump Estate Winery. Jonathan has been with the estate since 2006 and it was interesting hearing his explanations and joining in the conversation as questions came from not only the small group of guests, but also participants via Twitter and Ustream using the hashtag #VAWineChat. Virginia Wine Chat is a virtual participation event for busy wine lovers to gather, share and learn in the comfort of their own home (or wherever they may be at the scheduled moment). Started in 2013 by Frank Morgan after realizing the interest and opportunity for social media oenophiles to meet virtually. Make plans to participate next month if you aren’t already involved. Greeted by the Trump management and hospitality team, we were immediately offered our choice of two wines, a Viognier and a Sparkling Reserve. Bubbles trump every time for me-pun intended. Appetizers were delicious with my favorite served, mini gluten-free crab cakes! Yummy with the crisp sparkling wine! Strolling through the elegantly appointed rooms accented with tasteful Christmas decorations, we made ourselves at home (oh my gosh!) and settled in to the Library, a combination room including leather tufted sofas, fireplace and billiard table and served by the adjacent bar. Hospitality abounded throughout the evening and we proceeded to the event itself. Note:pinching myself, could get really used to this! The wines featured were a 2009 Blanc de Blanc, 2009 Sparkling Rose, 2014 Chardonnay and the pre-release 2014 Meritage. All were very good, the Meritage was a little young and needed more time to develop ( they already know that) but well received. I think we had a consensus that the overall favorite, and by the way, we all asked for a second pour, was the 2009 Blanc de Blanc-effervescent and citrusy with a nice light yeasty influence. Promises and Contrasts. Pippin Hill Farm and Vineyards is the newest addition to the Monticello Trail AVA but has the aura of generations of history. 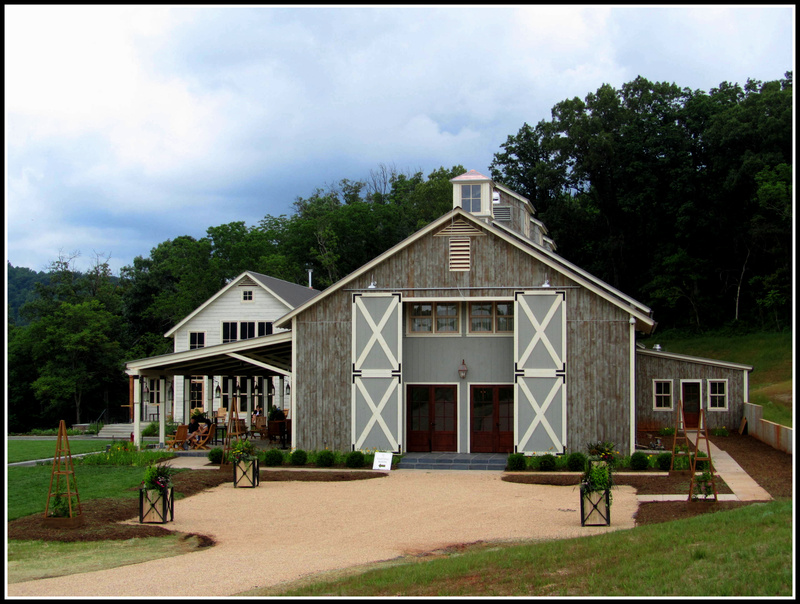 Set in a valley in the southern end of Albemarle County, this boutique winery promises to be one of the most coveted locations for wedding celebrations in Virginia. I was struck by the contrasts of old and new, soft and coarse, refined and rustic; the promise of a new venture developing like a fine Bordeaux into an exquisite wedding destination. Upon first approach from the road, the hillside divide into two vineyards, both are in first year growth. Very new! On the crest of the hill, the Granary and Tasting Room are visible, designed in the style of a classic farmstead house with the barn blending into the rolling countryside. The structure appears old but the newly sown grass and plantings give it away. The panoramic views are Old World and I can’t help but anticipate the views after the vines mature, anchoring the vista of the Blue Ridge Mountains and surrounding hills ! Definitely add this to your Autumn leaf peeping, wine tasting outings! Owners, Dean Andrews and Lynn Easton Andrews, have assembled the best team, from the architects and landscape designer to the interior design team of JohnSarahJohn! Dean has an extensive 30 year background in the hospitality industry specificically, international hotel operations and development including properties in the US, Caribbean, French Polynesia and Mexico. Lynn’s professional career includes producing large events for Fortune 500 corporations, non-profit organizations, and top-level social clients. Lynn’s expertise is described as orchestrating “high-touch” events that require maximum attention to detail. It appears that between them, they have the recipe for success! 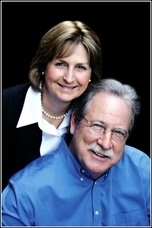 Chris Hill is the vineyard consultant with decades of experience in vineyard establishment and management. Michael Shaps of Virginia Wineworks is partnering with Pippin Hill to produce wines and supplement with his label to get things rolling. The Pippin Hill facility offers five different arenas for entertaining: the main event building, The Granary; the Winery Tasting Room; the Veranda & Courtyard; the Wine Cellar and Alfresco Dining in the Vineyard. The elements of design were artistically placed with photo opportunities in mind ( at least that was my impression) and permit countless locations for keepsake snapshots! Little niches placed here and there are priceless for stolen kisses and intimate moments! Perfect for exchanging wedding promises! Already, the wedding photographers and planners are blogging about this hot location! While I was visiting, three different groups were contemplating scheduling their big event here and judging by the smiles and number of camera clicks, I’d have to believe some deposits were placed! The Granary is a barn inspired structure and the main event hall for wedding receptions, accommodating up to 200 people with over 3,600 square feet of open floor space beneath a dramatic two- story wood beamed ceiling. 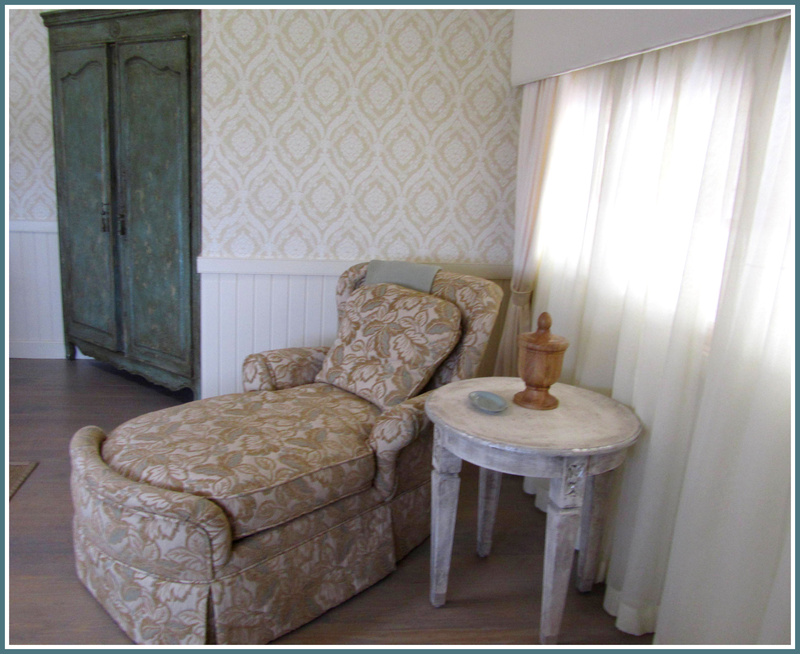 Old wood and rustic, distressed furniture coupled with lavish fabrics create a sense of established elegance, feminine yet substantial. 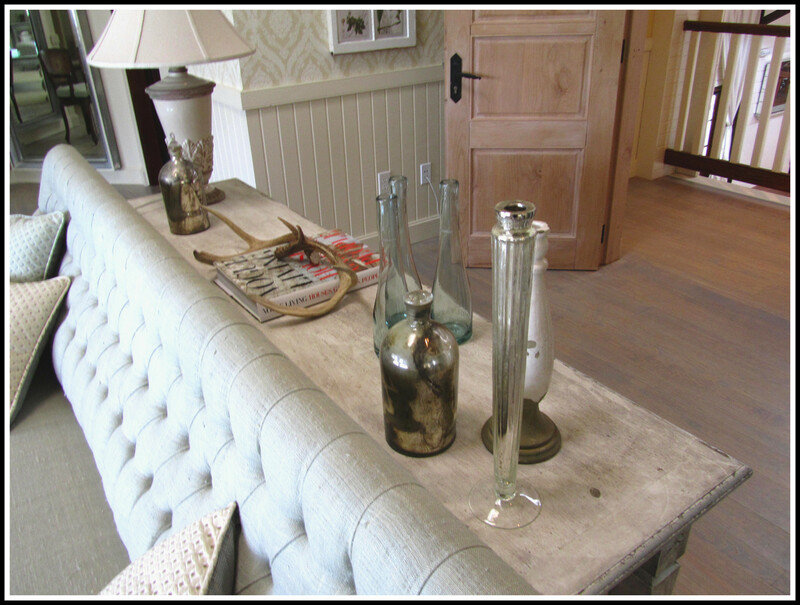 Several pieces were selected and imported from San Miguel, Mexico adding to the international feel. Upstairs, Brides can dress and primp with their bridesmaids in the Bridal Loft delicately decorated with wispy sheer draperies and soft linen tweed upholstery. Below, wine tasting and a “vineyard to table” menu are offered on the Veranda and in the Tasting Room, which coincidentally has a loft for the groom to prepare for the occasion! The rustic decorating style continues throughout interior and exterior, with little touches of country elegance achieving an effect of a French or Tuscan farmhouse. 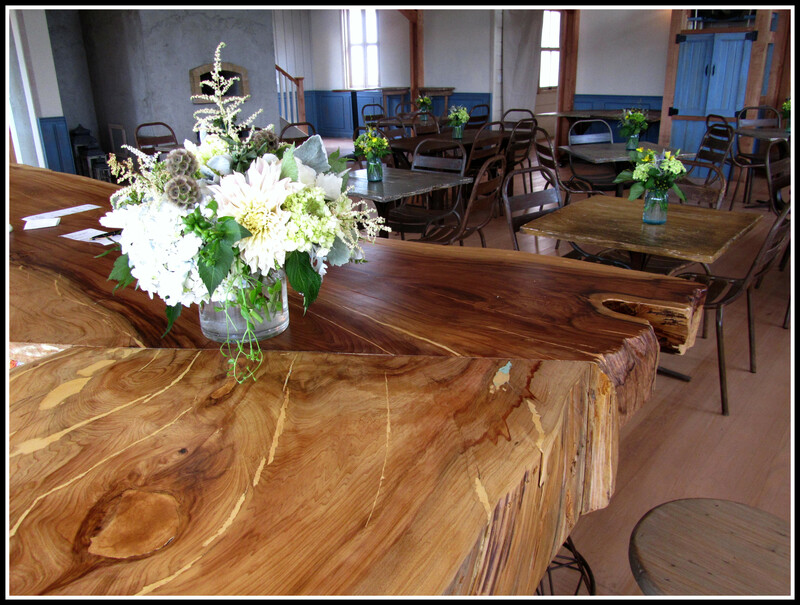 In the Tasting Room, the bar top is constructed out of harvested wood from a Montezuma Cypress tree. These trees are extremely hardy with a long lifespan, some can be up to 2,000 years old! The Montezuma Cypress is Mexico’s national tree and cannot be cut down while still alive. This tree was estimated to have died 10 years ago. The tree’s circumference is 10′ and stood approximately 70-80′ tall! Stay tuned for my next post which will be Part II of Pippin Hill, the wine and ambience!